At ZipBooks, our goal is always to help you make smarter business decisions. One of our unique features is the Business Health Score. We’ll give you a score, based on measurable data from all areas of your account, that will help determine the hygiene and success of your business. ZipBooks will then give you recommendations to make your business healthier, and keep your customers happy. Hygiene consists of practices conducive to maintaining good health and preventing disease. This applies to your teeth as well as your business health! 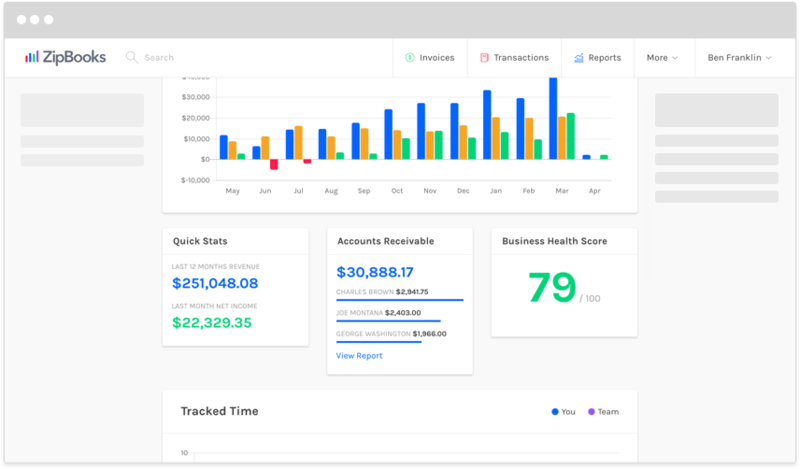 When you follow best practices for things like account setup, bookkeeping, and billing, you can keep your business healthy and running at top notch. Strong standards allow you to scale or quickly grow your company; poor standards like neglect or sloppy habits may lead to missed opportunities or even business failure. Success is defined as growing and sustaining your business. We look for repeat customers, timely payments, growth in sales, and recurring revenue. Based on the analysis of these and other important factors, we formulate a measure of your success as the first part of your Business Health Score. ZipBooks creates a measure of your hygiene and combines it with your measure of success to formulate your general Business Health Score.